Penn's Corner is looking to hire a delivery driver! Posted 3/31/2011 12:40pm by Neil Stauffer. Penn's Corner is looking for a talented and dedicated delivery driver for the 2011 season and beyond. The delivery driver will help us make our weekly CSA, Farm Stand, & Restaurant deliveries. We prefer applicants who are willing to have a flexible schedule. The right candidate will start with a part-time schedule (20 - 30 hours/week), but more hours will become available as the growing season progresses. Click here to check out the Job Description and contact Clint at 412-335-3947 or clint@pennscorner.com if you or someone you know is interested! Posted 3/31/2011 9:05am by Neil Stauffer. Our 2011 spring shares are sold out. If you were hoping to purchase a spring share please email us at csa@pennscorner.com. We will put your name on a waiting list just in case we have any spots become available. We still have summer shares available so be sure to grab one before they are all gone! Click here to sign up now. Come visit us at the Farm to Table Conference! Posted 3/24/2011 5:10pm by Neil Stauffer. Posted 3/9/2011 11:17am by Neil Stauffer. 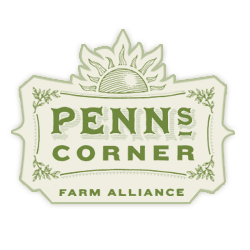 Check out this PITTSBURGH TRIBUNE article featuring Penn's Corner, or come see us at the Local Food Grower Showcase tomorrow! Penn's Corner 2011 CSA Sign Up! Posted 3/4/2011 12:50pm by Penn's Corner Farm Alliance. Penn's Corner is still accepting 2011 CSA members. Our spring share begins April 12th. That means that our farmers have no more time to be idle and are hard at work already. Seeds are germinating as I type! Sign up will close for the share on April 1st. That leaves just four weeks to grab one up. Click this link to go to our sign up page. We no longer have a pick up at Tazza D'Oro in Highland Park but we have two other locations in the neighborhood. One is on Jackson and one on Heberton near Stanton. We have a new location in Dormont on Windermere. A new Squirrel Hill location on Fair Oaks. New Greenfield location back on Millington (at a different address). A third Mt. Lebanon location on Briarwood. Our Cranberry pick up has moved to nearby Bradford Woods. Lawrenceville will no longer be at Dozen on Butler but has moved to a residence on Penn Avenue. And finally, our Point Breeze location as moved to Lloyd Street. If you have any questions or need help signing up please contact Karlin at csa@pennscorner.com. Looking to split a CSA share? Posted 3/1/2011 1:51pm by Neil Stauffer. Is the prospect of a CSA box every week too overwhelming? Try splitting a share with someone! Contact us at csa@pennscorner.com and we will try and help connect you with someone in your area to split a share with! Posted 2/24/2011 2:50pm by Neil Stauffer. One of PCFA's member farms, Matthew's Family Farm, is looking for a farming apprentice for the 2011 season for their vegetable farm in Eighty Four, PA. Interested? Check out this link and apply! Get your 2011 CSA share now! Posted 2/14/2011 1:38pm by Neil Stauffer. 2011 CSA memberships are selling fast this year! Seems like folks are ready for spring and all of the wonderful, locally produced goodies that come with an early CSA share. We still have shares available so sign up for yours while there is still time. We are already beginning to plan for those first boxes in April! Posted 2/9/2011 10:35am by Neil Stauffer. about sustainable local food systems! Posted 1/21/2011 3:33pm by Penn's Corner Farm Alliance.